I loved the shape of this old pump. Yet another barn behind, this one brown, though. Added interest: this is on the property of two very well-known American television stars! Nice pump. Whose it it? Bob: don't know if it works or not! Nicola: I probably shouldn't reveal it! But they are a married couple who are both currently in very popular tv shows! 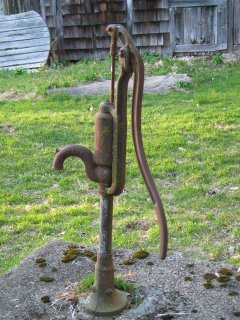 Nice, some of the farms here still have hand pumps maybe one day I could photo the version. That is a cool water pump - you just want to try and see if water comes gushing out!